Who the heck is John F. Weldon???? 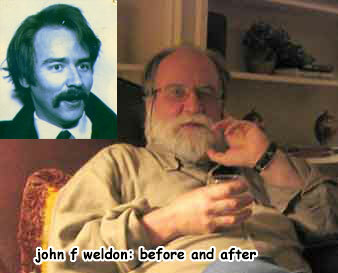 John F Weldon was hatched in 1945 in Belleville Ontario, but moved to Montreal after four days and has been there ever since. In 1967 he wrote the musical comedy "Genius is a Four Letter Word" which was performed at MacDonald College of McGill University. In 1969 he published the comic book "Pipkin Papers", which later became a collector's item of great value. Special Delivery (with Eunice Macaulay) (1978) won the Oscar© for Best Animated Short in 1979. Log Driver's Waltz (1979) is possibly the most-often-seen NFB film. Real Inside (1984) is a combined live-action-animation film using techniques which presaged those used in Roger Rabbit. The Lump (1991) was the first use of the technique dubbed Recyclomation by Marcy Page. The Hungry Squid (2002) combined real puppets and collaged photos, manipulated in a computer. His latest film was Home Security (2004) (winner Chris Award, Columbus Ohio). He retired in 2004, and has since devoted himself to songwriting, comic books, short films, and an online comic strip. He has a lovely, talented and highly tolerant spouse named Margaret Griffin, who bore him two lovely but eccentric children. They are Alexander Mycroft Weldon (born 1979) who freelances in the gaming world, and Dinah Castle Weldon (b. 1983), who has her hands full with her identical twins Alice & Hazel. Alexander is married to Ronit Milo & they have a cute little guy named Oliver Isaac. Dinah is married to Ryan Wilner, a comical fellow, and has the aforementioned twins. I'll be adding more biographical material from time to time: for starters, Here's God and the Boy Scouts. And here's A Zen Riot! And here's An Early Adventure with the American Medical System.